Titanic: Voices from the Disaster by Deborah Hopkinson is one of the finalists for the 2013 YALSA Award for Excellence in Nonfiction for Young Adults. If you’ve already read Titanic and are finding yourself wanting more, you may also enjoy these fictional stories with similar themes, subjects, and elements. Read and liked a bunch of these novels already? Give Titanic a try! Arrogance and innocence, hubris and hope — twenty-four haunting voices of the Titanic tragedy, as well as the iceberg itself, are evoked in a stunning tour de force. Millionaire John Jacob Astor hopes to bring home his pregnant teen bride with a minimum of media scandal. A beautiful Lebanese refugee, on her way to family in Florida, discovers the first stirrings of love. And an ancient iceberg glides south, anticipating its fateful encounter. 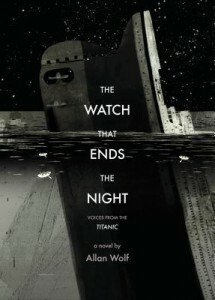 The voices in this remarkable re-creation of the Titanic disaster span classes and stations, from Margaret (“the unsinkable Molly”) Brown to the captain who went down with his ship; from the lookout and wireless men to a young boy in search of dragons and a gambler in search of marks. Slipping in telegraphs, undertaker’s reports, and other records, poet Allan Wolf offers a breathtaking, intimate glimpse at the lives behind the tragedy, told with clear-eyed compassion and astounding emotional power. 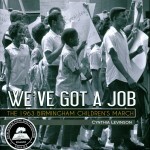 Despite the bullying Nanny Mackintosh, for whom she is an extra pair of hands, she loves her work and her young charges. Then everything changes. The family decides to sail to New York aboard the Titanic. An accident to the children’s nanny, only days prior to the sailing, means that Louisa must go in her stead. She cannot refuse, although she dreads even the mention of the ocean. Memories she has suppressed, except in nightmares, come crowding back. When Louisa was five and her sister seven years old, their two-year-old brother died on an outing to the seaside. Since that time, Louisa has had a fear of the ocean. She blames herself for the accident, though she has been told it wasn’t her fault. 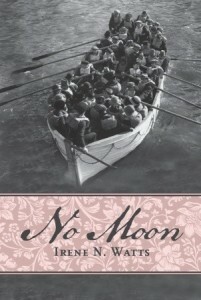 How Louisa learns self-reliance, overcomes her fears, and goes beyond what is expected of a girl makes No Moon an unforgettable story. The RMS Titanic is the most luxurious ship ever built, but for eighteen-year-old Tess Davies it’s a prison. Travelling as a maid for the family she has served for years, Tess is trapped in their employ amid painful memories and family secrets. When she meets Alec, a handsome upper class passenger, Tess falls helplessly in love. But Alec has secrets of his ownâ€¦ and soon Tess is entangled in a dangerous game. A sinister brotherhood that will do anything to induct Alec into their mystical order has followed him onboard. And Tess is now their most powerful pawn. Louise Lambert has always dreamed of movie starlets and exquisite gowns and longs for the day when she can fill the closet of her normal suburban home with stylish treasures. But when she receives a mysterious invitation to a vintage fashion sale in the mail, her once painfully average life is magically transformed into a time-travel adventure. I really loved The Watch That Ends the Night. It was beautifully done and the audio book is phenomenal. 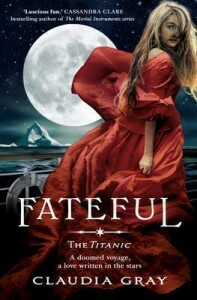 I also thought Fateful was a fun story set on the Titanic. As a 15 year old Titanic fan, it’s so nice to see other YA books on the Titanic and the stories that resulted out of that night. I’ve recently written and published a book on one of the heroes that was on the Titanic that fateful night ~ Father Thomas Byles, a Catholic priest, who sacrificed his life for others onboard the ship. You can take a look at my book “A Titanic Hero: Thomas Byles” on Amazon or on our webpage: http://www.TitanicHeroes.com.